GOMA, 16 January 2008 (IRIN) - The insurgency led by dissident general Laurent Nkunda in the Democratic Republic of Congo (DRC) has spelt out its demands at a peace conference to end the conflict in the troubled North and South Kivu provinces in the east, where, according to the UN, insecurity and human rights abuses have displaced at least half a million people in the past 12 months. Nkunda's National Congress for the Defence of the Congolese People (CNDP) demanded talks with the government, the repatriation of Rwandan Hutu rebels active in the country, the return of refugees and exiles and the release of political prisoners. "The CNDP hereby solemnly takes all its responsibilities by recommending that the government hold direct negotiations with its belligerents through a neutral mediation and on terms acceptable to all so that the demands expressed above find adequate answers as soon as possible for peace and security to return quickly to our two provinces," Kambasu Ngeve, head of the CNDP delegation, told the conference in Goma, capital of North Kivu, on 15 January. The CNDP wants exiles such as opposition leader Jean-Pierre Bemba, a former vice-president who challenged President Joseph Kabila in 2006 elections but lost the poll, to return. "The CNDP solemnly declares its readiness to make a significant contribution in the search for solutions for a lasting peace in our country in general and in particular in Kivu," said Ngeve. North Kivu, where Nkunda's forces have been fighting government troops, is worst affected by the displacement crisis, according to the UN Office for the Coordination of Humanitarian Affairs (OCHA). Since August 2007, unrest has forced about 232,000 people to flee their homes, bringing the cumulative total of internally displaced persons (IDPs) in the province to over 800,000, according to an OCHA statement issued on 15 January. "Such an overwhelming level of new displacement is very worrying," said John Holmes, the UN Under-Secretary-General for Humanitarian Affairs and Emergency Relief Coordinator. "Unless peace can be quickly restored, we are bound to see further human tragedy in a country trying to emerge from years of civil war. Armed groups must stop targeting civilians." Unconfirmed reports suggested there may be an additional 150,000 displaced, OCHA said, adding that in some of the most affected areas, such as Petit Nord, the displaced constitute up to 30 percent of the population. In South Kivu, more than 100,000 people were displaced in the course of last year, even as the province became a "safe haven" for 60,000 people fleeing North Kivu, according to OCHA. Economic and social pressure on communities hosting the displaced and the infrastructure was pushing an already poor people deeper into destitution. Malnutrition rates were on the rise, even where they had been brought under control, with global acute malnutrition reaching levels 17 percent in some areas, OCHA said. Ngeve claimed that CNDP took up arms against the government because the insurgency was opposed to integration into the national army, allegedly by the state, of Rwandan Hutu fighters who fled to the DRC after the Rwandan genocide in 1994. He also accused the government of collaborating with various militias active in the Kivus. Nkunda, an ethnic Tutsi, says his CNDP forces are fighting to protect eastern Congo's minority Tutsi population from attacks by Hutu militias known as the FDLR (Forces démocratiques de libération du Rwanda), which have links to the perpetrators of Rwanda's genocide. 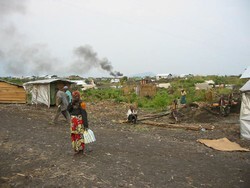 Fighting intensified in August 2007 when Nkunda pulled out of a January peace agreement that would have seen his forces mixed with Congo's regular army. 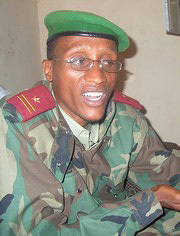 Congo's army, he said, had not done enough to neutralise the FDLR. "The authorities of our country must have reasonable [and] unwavering determination to rid Kivu in particular and our country in general of these genocidal forces," said Ngeve. Representatives of indigenous armed groups known as the Mai Mai, which have often been roped in by the government to help fight rebel forces, such as Nkunda's CNDP, for their part accused Nkunda of fighting to defend the interests of Rwanda in DRC.